The Atelier de l’Armée collection is made for the every day city cyclist, the outdoors type and the adventure seeker who likes to travel in style. Made out of thick vegetable tanned full grain cowhide leather. Our iron-branded sleeve is build to resist and strong enough to protect your contents. Vegetable tanning is the most traditional and ecofriendly method of tanning. No chemicals are used in the process and vegetable tanned leather is recyclable. Our leather is aniline dyed, which is a natural dying process that retains the hide’s natural surface. 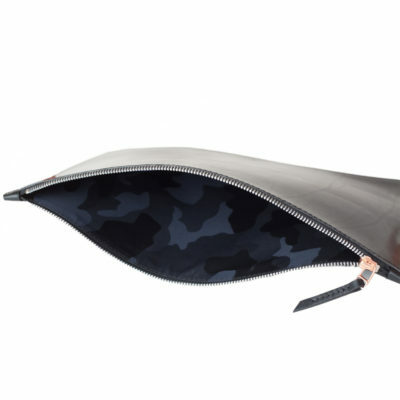 Features: This sleeve is fully lined jacquard woven bonded camouflage nylon lining from Italy and has an aluminium YKK zipper with copper slider and leather puller. 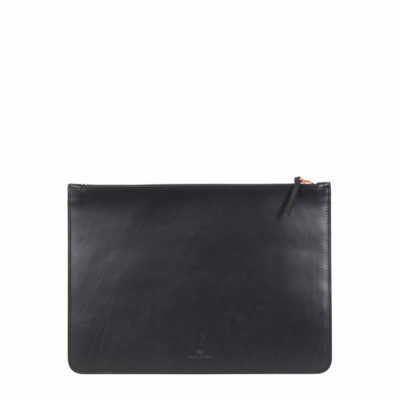 Features: This laptop sleeve is made out of thick vegetable tanned full grain cowhide leather and is iron-branded. 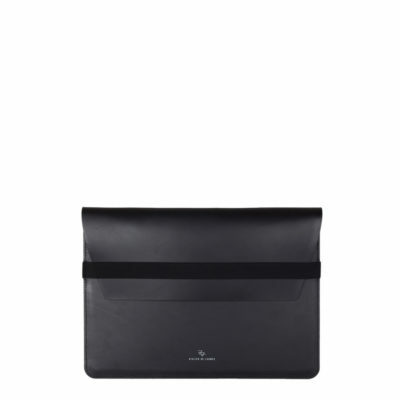 It can be used for a 13″ inch laptop or as a document holder. It closes by an elastic strap, build to resist and strong enough to protect your laptop.